Brazilian pianist Ruth Serrão performs a solo program of rarely-heard contemporary music by composers from Brazil: Heitor Villa-Lobos’ Prelúdio, Claudia Caldeira’s Pra Piano #1, Maria Helena Rosas Fernandes’ Ciclo #3, Cesar Guerra-Peixe’s The Spotted Cat and Maiden Swallow (a love story) and Five Tropical Preludes. 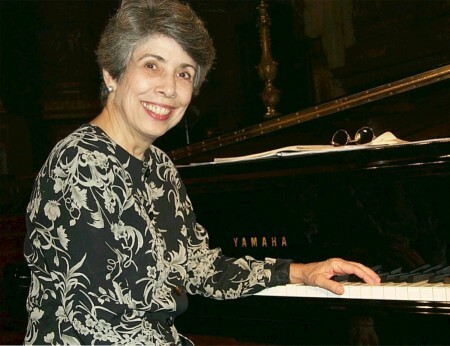 Ruth Serrão studied piano in Rio de Janeiro and in Paris. Currently living in Rio de Janeiro, she performs as a pianist and chamber musician throughout the country and has taught at the graduate program at UNIRIO. In the US she has appeared as a soloist, in chamber groups and with orchestras. She has worked with young musicians at the preparatory and college levels, given Master classes and participated in juries and music festivals. An acknowledged authority on Brazilian music, she has presented lectures and concerts on the subject in the US, Europe, and in her native country. She has premiered many works of contemporary composers who have dedicated their works to her. Ms. Serrão has performed in many of the Villa-Lobos celebrations in Brasilia and S. Paulo, including the world premiere of the complete series of Chôros, at the XXXV Villa-Lobos Festival in Rio de Janeiro. She has participated in the Mozart bicentennial celebrations and Festival Panamericano de Música, giving the first performance of Guilherme Bauer’s Variações Rítmicas para Piano e Orquestra. Among her many recordings under the auspices of the Brazilian government, Ms. Serrão has been responsible for the revival of Padre José Mauricio’s keyboard music. Her next project, O Piano de Guerra-Peixe, is a two-CD collection presenting an overview of the composer’s piano works, from 1943 to his last composition in 1993.